My rating: 7/10. Great watch. Very affordable. Hello, today I’m doing a Casio MQ24/7B review. 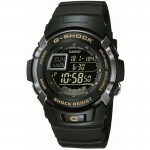 I figured it was time to take a look at another one of Casio’s most popular affordable watches. This model the MQ24/7B is ideal for those who are after a simple timepiece with no extra requirements. It’s lightweight and just does the job reliably and accurately. I hope you enjoy this Casio MQ24/7B review below. The design of this watch is pretty basic overall, but that’s the whole point of it. It’s a very affordable watch that focuses on one thing, telling the time. 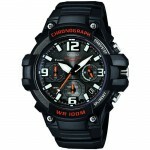 The dial has a high-visibility design to it with the white dial and black numeral hour markers with slim black hands. The casing is made of a plastic resin blend and has a steel case back. Protecting the dial of the watch is an acrylic plastic glass. Acrylic is one of the most basic options available but gives the watch a more traditional look. The key benefit of acrylic is that it’s extremely affordable and scratches can often be easily buffed out with the correct technique. At the heart of the watch is a reliable Japanese quartz movement. Quartz movements are often used for their accuracy and reliability as well as not requiring much in the way of maintenance. Overall, it’s a movement I’m quite happy with in this timepiece. Being a more traditional watch this timepiece from Casio is actually a bit smaller than many you see around at the moment. It has a 35mm casing diameter with an 8mm thickness. This makes it quite a small slim watch that’s ideal for people with smaller wrists. The strap is made of a black rubber that’s sturdy and durable. The strap measures 15mm in width and is fitted with a standard buckle style clasp. It’s an easy to operate strap that should be ideal for most people. This watch from Casio has a simple basic water resistance rating. This makes the watch suitable for everyday use. Splash/rain resistant. Not suitable for showering, bathing, swimming, snorkelling, water related work and fishing. Band Rubber strap, standard length, 15mm width, standard buckle style clasp. Case Resin/rubber casing, sizing diameter: 35mm and thickness: 8mm. Dial Analogue display. The window lens is made of acrylic, scratches can easily be buffed out in most circumstances. 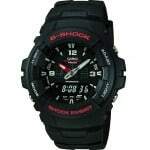 This is an ideal watch for those seeking something simple who like Casio’s classic watch designs. There’s not much in the way of features or high end specifications, but you wouldn’t be expecting that in a watch for this price range anyway. After looking into the watch design, quality, features, and pricing this watch received an 7/10 from us at The Watch Blog. Hope you enjoyed this Casio MQ24/7B review. Find more watch reviews below.